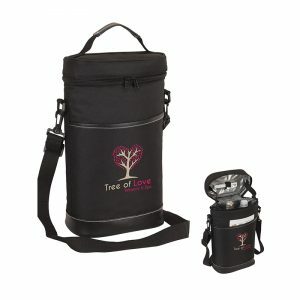 Looking for a different customer thank you gift this year? 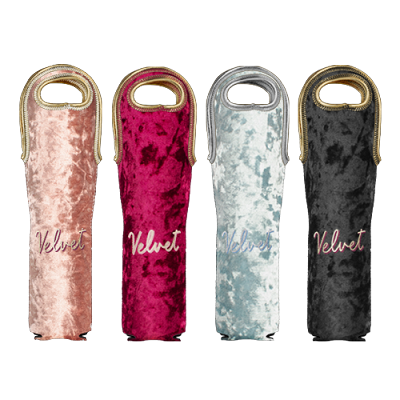 Velvet neoprene wine tote with logo imprinted is totally outside the box. 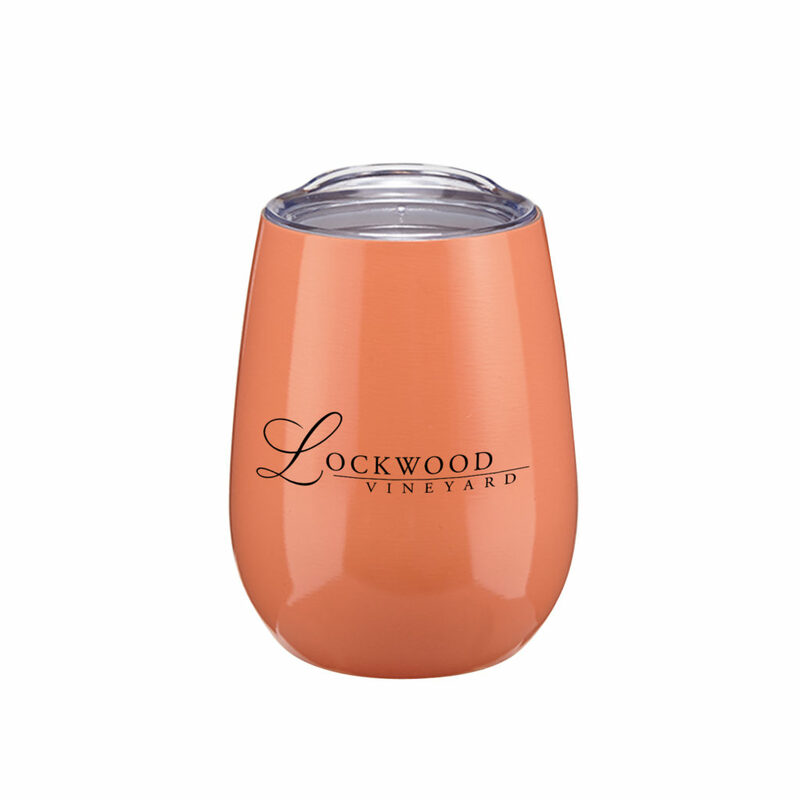 Holds most 750 ml wine bottles. Comes in Antique Rose, Cranberry, Dusty Blue, and Onyx. Imprint area is 3.5 x 7.5″. Min 24 at 8.38 ea, 49 at ea, 7.41 ea, 96 @ 6.74 ea, 144 @ 6.06 ea, 288+ at 5.53 ea. 45.00 set up. Order now for holiday giving. Item 1029-vel. 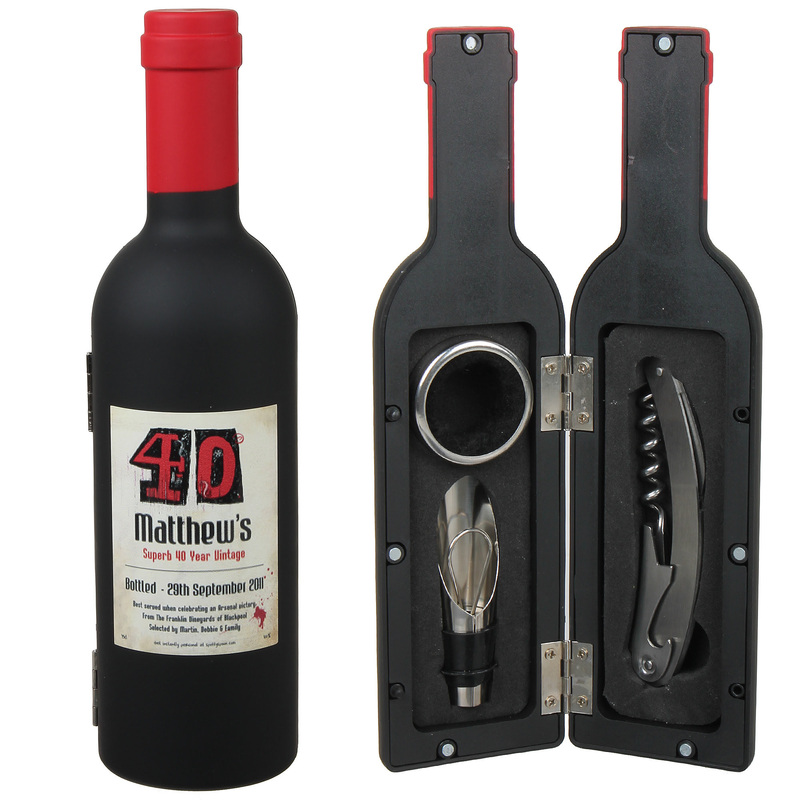 Four Piece Wine Set features all the necessities to pour the perfect glass. 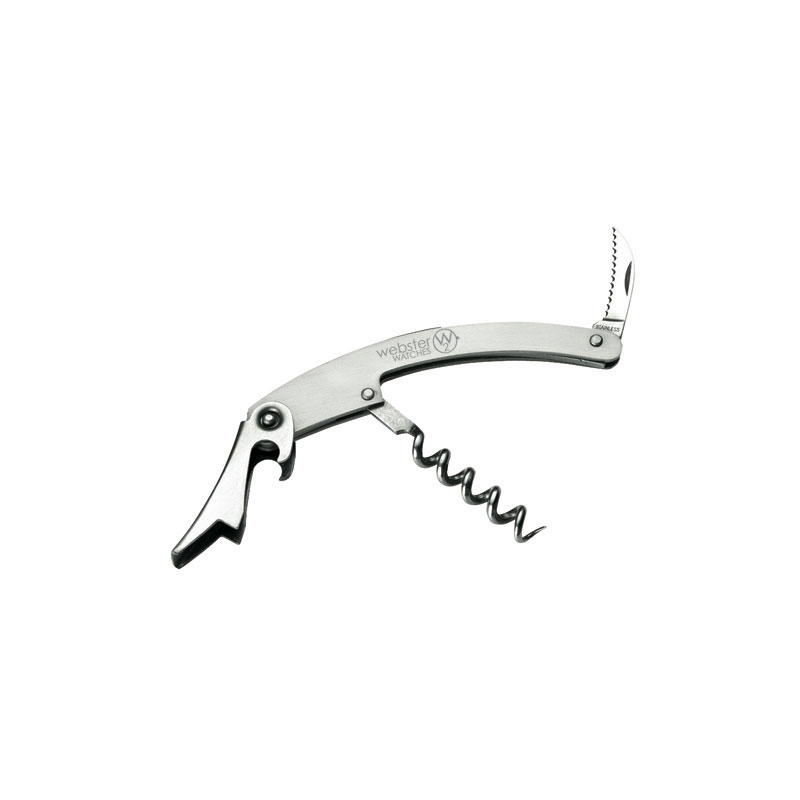 The kit includes a stainless steel bottle opener, drip-stop collar, perfect pour wine spout and bottle stopper. 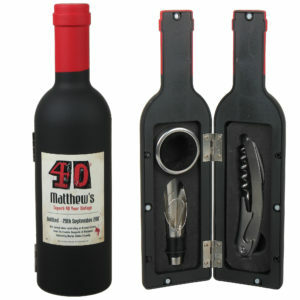 This set comes packed in a wine shaped storage case with magnetic closures which can store easily in racks and cellars. 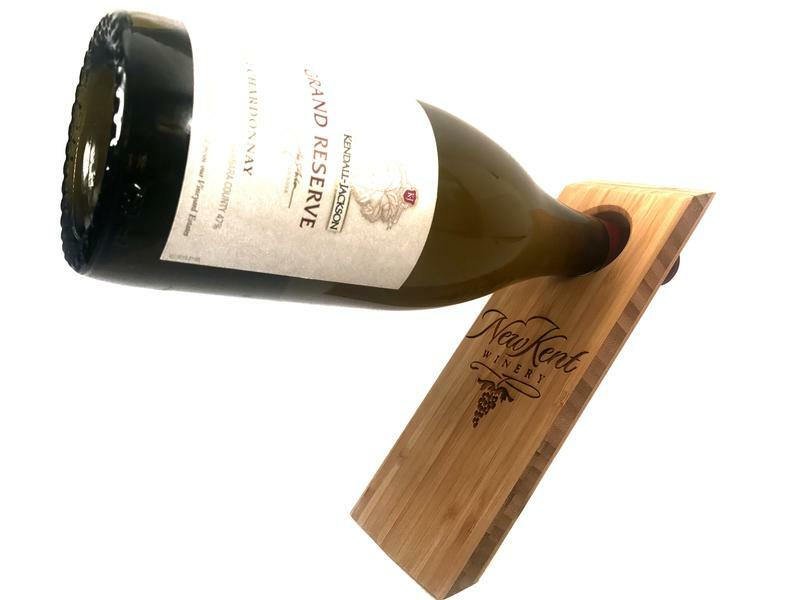 Includes a full color label making it look like an authentic wine bottle. Packed in a white gift box. Min. is 48 at 6.42 ea with a 31.25 set up. This sale price is good through 11-4-18 so order soon to save money on the items and set up. Item EWNE410. 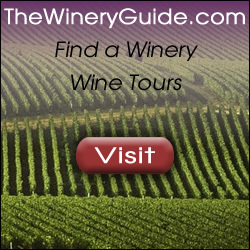 Looking for a quality wine related gift? These bamboo wine bottle balancers measures in at 9.75″ x3 .25″ and perfectly balances a bottle of wine in an incredible way. 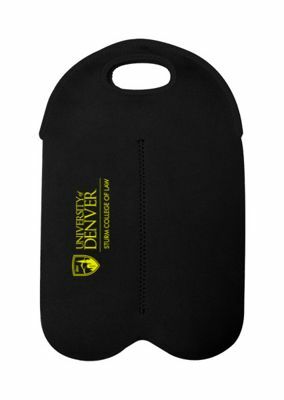 Engrave your logo on these. Min is 25, no set up. 10.99 ea. 50 at 10.25 ea, 100 at 9.75 ea, 150 at 9.25 ea, 200 at 8.99 ea, 250 at 8.75 ea, 500 at 8.50. Laser are is 2.75 x 2.75″. Item number qual1062. 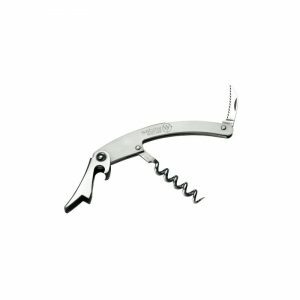 The Accio 3 function bar tool is all stainless steel construction and includes a corkscrew, serrated knife and bottle opener. 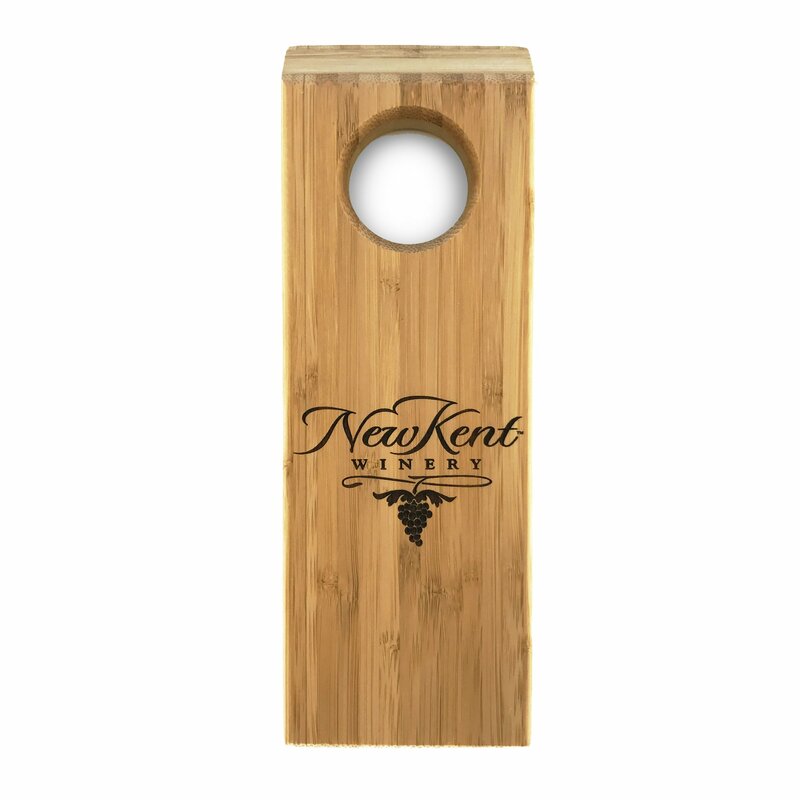 Great for bars, tradeshows, events, party favors, wine shops, wineries, liquor stores and more. Your logo or information can be laser engraved on front or back in 1 1/2″ W x 1/4″ H area. 150 min at 3.89 ea, 250 @ 3.59 ea, 500 at 3.29 ea, 1000 or more at 2.99 ea. Set up is 56.25. 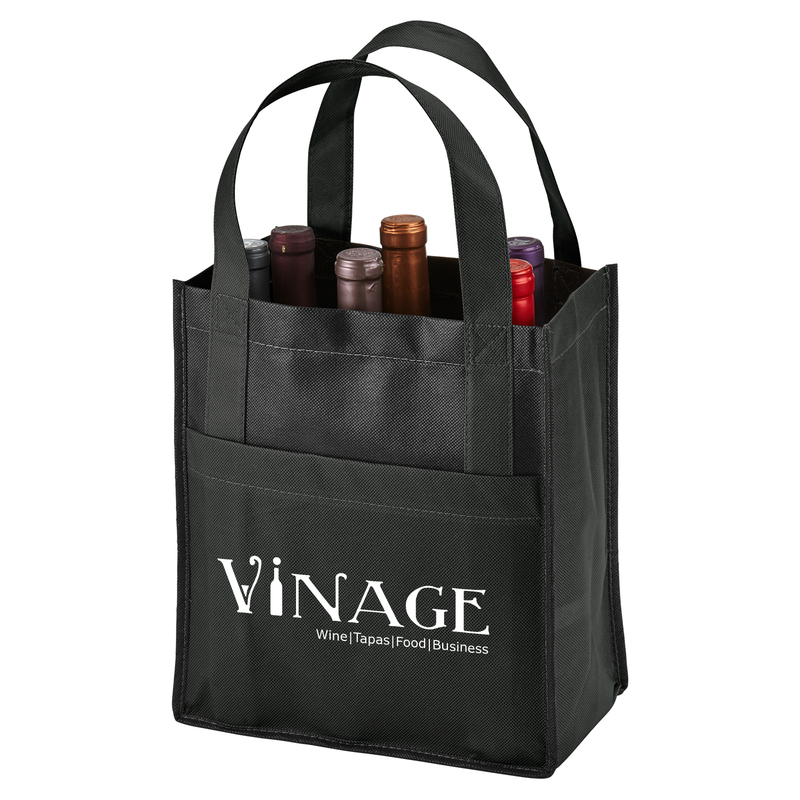 Looking for a wine tote that can hold 6 bottles? 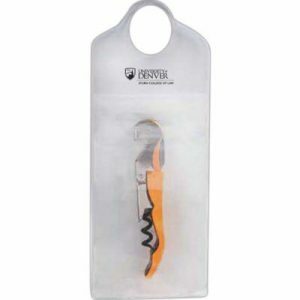 This 80 gsm bag is constructed of non-woven polypropylene. 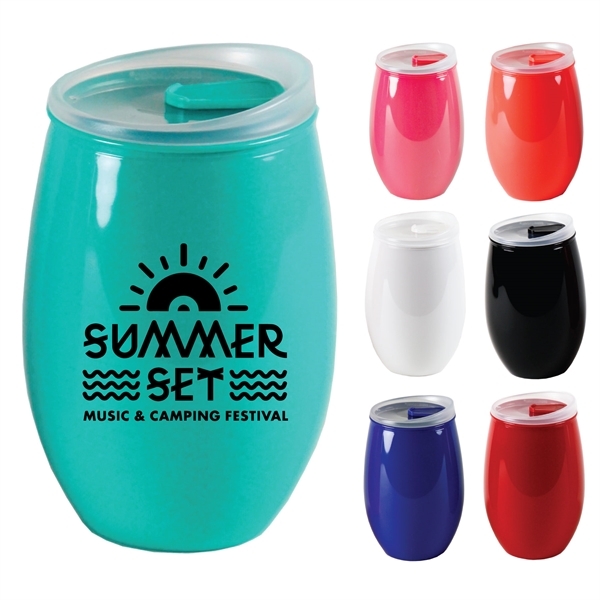 Features a two-tone design with outside pockets on front and 6 internal sleeves to hold 6 bottles of wine. 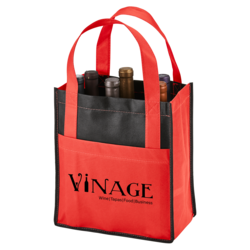 With matching colored front pocket and handles and reinforced 16″ handles, this is a great handout for tradeshows, wine stores or wineries. Comes in black on black, red/black, lime/black, purple/black, royal/black or gray/black. Imprint on the pocket in 4″ x 7″ area. Min is 150 at 2.59 or 250 or more at 2.28 sale price. Sale price (promo 5870) good through Dec. 24, 2017. After Dec 24, 250 are 2.49 ea, 500 are 2.43 ea, 1000 are 2.38 ea, 2500 2.35 ea. Set up is 50.00 one time. Item number 1876. Want a wine related gift that is classy and will be a welcome gift? 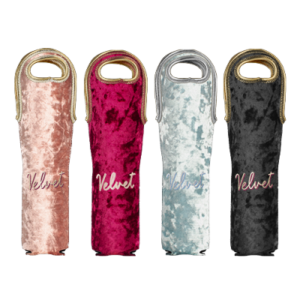 The Temecula double-bottle wine carrier made from durable 600D material with white contrast stitching and leatherette trim and base. 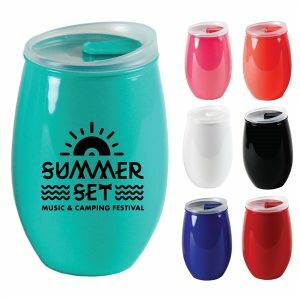 The padded main cooler compartment has a heat-sealed PEVA lining, zippered closure, folding bottle separator and a corkscrew bar tool in the top lid. 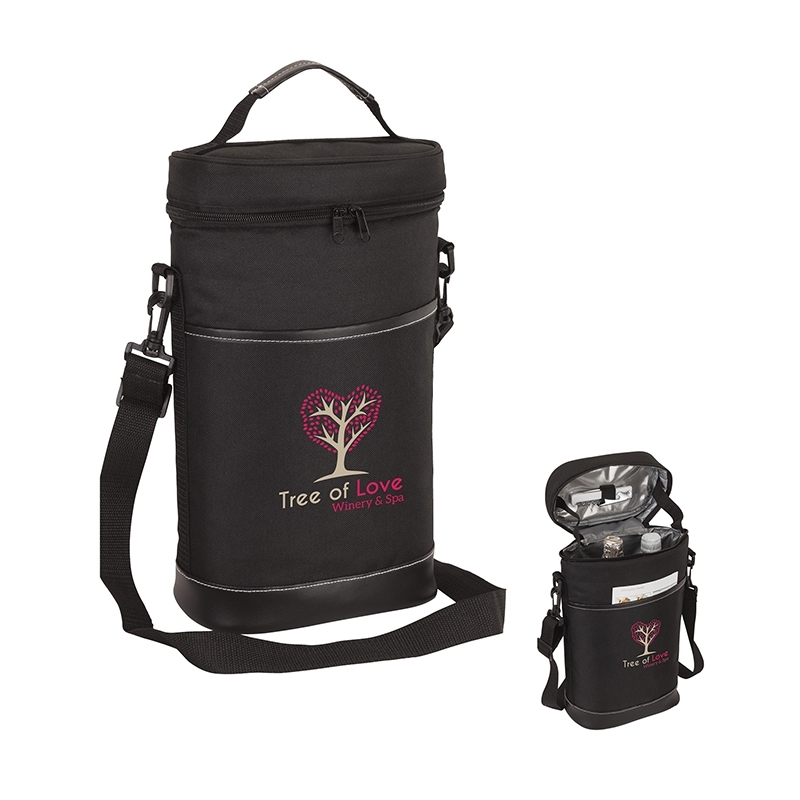 Outside features a front pocket, padded carry handle and a 1 1/4″ x 42 1/2″ removable and adjustable shoulder strap. Logo on front bottom 5-1/2″ w X 4″ h. Min 25 at 18.99 ea, 50 at 18.50 ea, 100 at 17.99 ea, 250 at 16.99 ea. Set up is 56.25. Item EH3520.